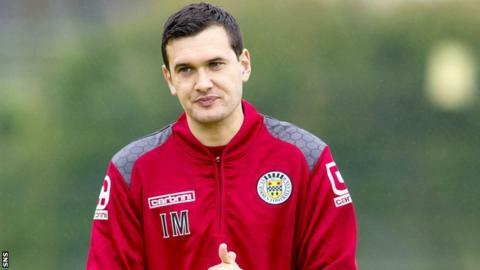 Ian Murray insists that St Mirren can challenge Rangers and Hibernian for promotion back to the Premiership. The Paisley club's manager acknowledges that his two former clubs are the favourites for the Championship title. However, he believes that if St Mirren can start the season strongly and be challenging by the turn of the year, then the club can react. "The gulf between ourselves and Hibs and Rangers isn't as great as people think," said Murray. St Mirren open their Championship campaign with a visit to Ibrox on Friday, then face Hibs next month. Murray has had to be patient with his recruitment strategy, with finances tight at the club following relegation, but he is confident that the squad he has assembled will cope with the challenge in his first season in charge at St Mirren Park. "You look around the other teams and it's no secret, we all get offered the same players on trial," he said. "There's not one that we've missed out on yet that we've been desperate for. We've missed out on a couple of loan deals but not because they went anywhere else, just that they're not allowed out. "We've got a smallish squad, but we feel that the 14, 15 guys that we've got, particularly the young players, in the long term will be good enough to play for our team, so we need to be sure we get the right ones in. "We'll keep trying and if we get one or two in before Friday, fantastic, but if we have to go two or three games into the season then fine." Murray, who left Dumbarton in May to sign a two-year contract in Paisley, added: "I still think Hibs are slight favourites, because you can't base it on one game [Rangers' 6-2 win at Easter Road]. It's certainly not going to be like last year [with Hearts], where Hibs or Rangers walk away with the league. "I based Hibs as favourites because the players have played in the league longer, they've worked with their manager for longer, it's their second season in the league, but that doesn't mean I'm going to be right. "It's all about the start. Look at Hearts' start last season - nobody could catch them. We feel that at Christmas we will need to re-evaluate what we think we can do and, if we need to, invest in the squad. "We've had a good pre-season in terms of the teams we've played. It's going to be totally different at Ibrox on Friday. "Pre-season games are great for fitness, but Friday is when it all starts, the tinkering with formations and the fitness issues are all done. The players should be ready to go."